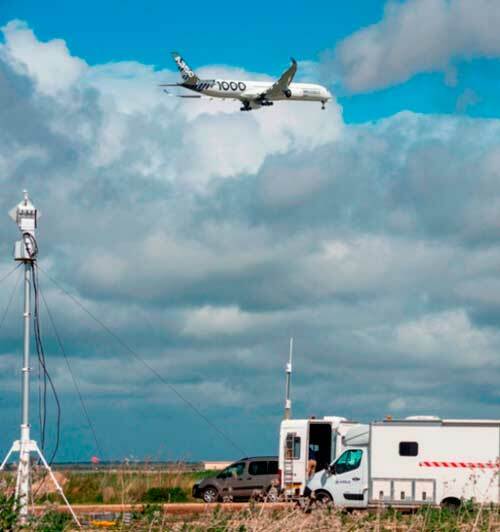 Airbus’ A350-1000, MSN065 test aircraft, fitted with cabin, has completed a series of noise tests in Moron, south of Spain, between March 27 and April 5th, as part of its type certification flight test campaign, paving the way for entry into service on schedule before year end. The aircraft, together with acoustic ground facilities around the Morón Air Force base, were equipped with instruments and sensors to measure external noise levels during take-off and landing phases of flight, as well as engine run ups. The latest generation Rolls-Royce engines combined with state-of-the-art aerodynamics technologies contribute to the A350-1000’s reduced noise footprint. Early results confirm the -1000 is very quiet, easily complying with external noise certification requirements with significant margins versus current applicable requirements (EASA CS-36 and FAA Part 36). Like its sister aircraft the -900 which is in service with 11 carriers worldwide, the A350-1000 will be a good neighbor to communities around airports. Three A350-1000 flight test aircraft (MSN059, MSN071 and MSN065) are flying in the intensive Type Certification campaign which is progressing as planned. The A350-1000 is the latest member of the Airbus leading widebody family, together with the A330neo, offering unprecedented levels of operating efficiency, low noise and true long-range capability. As well as having a longer fuselage to accommodate 40 more passengers than the A350-900, the A350-1000 also features a modified wing trailing-edge, new six-wheel main landing gears and more powerful Rolls-Royce Trent XWB-97 engines. The A350-1000 embodies all of the fuel efficiency and ‘Airspace’ cabin comfort of the original A350-900 – but with extra size perfectly tailored for our customers on some of their busiest long-haul routes. To date 12 customers from five continents have placed orders for a total of 211 A350-1000s.